For my final match of the weekend I ventured out into rural Gelderland to the small city of Doetinchem (pronounced Do-tik-em). 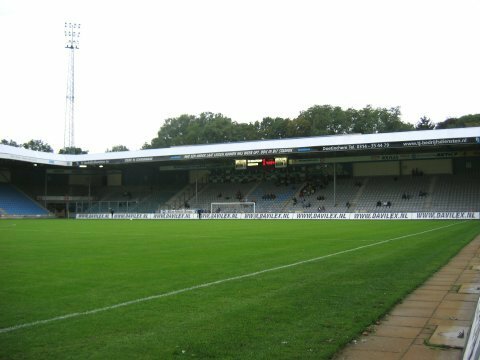 This is the home of De Graafschap, the best supported club in the first division and a club with proud traditions and a rich history. De Vijverberg translates as 'Stadium of the Super Farmers' whilst the club name simply means 'The County'. Comparisons can be drawn to perhaps Ipswich Town in terms of Doetinchem's rural location, the fanatical and loyal, local support and the respectfulness shown towards them by other Dutch clubs. Although only a ten minute walk from the centre, De Vijverberg is in a countryside setting with woodland, horse paddocks and country lanes surrounding three sides yet inside you would never know as the stadium appears vast and completely enclosed at the corners. It's another very English stadium in many respects with steeply raked stands upon which the fans tend to stand rather than sit and a good old fashioned noisy atmosphere. This was the only game I hadn't reserved a ticket for but had no problem in buying one at the reception as De Graafschap rarely achieve a full house in the 11,000 capacity De Vijverberg. Nevertheless, the 7,544 inside created an excellent atmosphere for the game against HFC Haarlem who had started the season well, winning 6-1 away at TOP on the Friday. Ex-Millwall striker Berry Powel lead the De Graafschap line and it was he and Jeffrey De Visscher who combined for the latter to guide home the opening goal on 8 minutes. Two minutes later, Van Beukring skied a penalty for the home side and when on 18 minutes they were awarded another spot-kick, Powel wrestled the ball out of Van Beukring's hands to crash home number two. When late on De Graafschap were given their third penalty to seal the game, Powel handed the ball back to Van Beukring to make amends! So, another decent game with plenty of goals in one of Holland's more unusual footballing homes. As is always the case with the excellent Dutch transport system, no problems encountered and no delays nor confusion. A great country with good, friendly people and a strong footballing culture.